I saw today that a child survived swallowing 37 magnets, so powerful they had twisted and blocked her intestines. 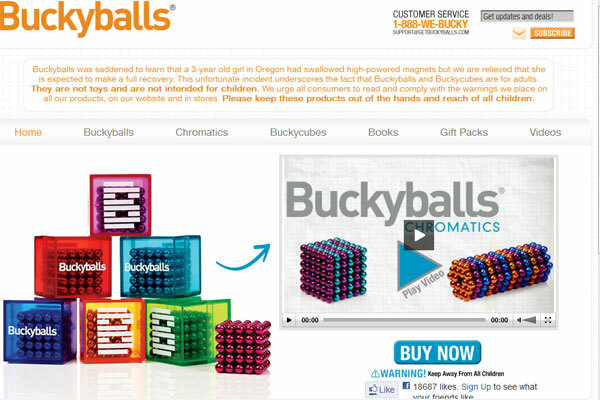 These were Buckyballs, which the company says are toys for adults, not children. I doubt children know they are for adults, only. They certainly look like toys that children would want to play with. Even though the company says they are not “toys,” some of these magnets were recalled last year for failure to comply with Federal toy standards. There simply is no legitimate reason for magnets so strong that they can twist and bind a person’s intestines. These are inherently dangerous around toddlers. The Consumer Product Safety Commission reports that 22 incidents involving magnets and children from June 2009 to October 2011, with 11 of those requiring surgery to remove the magnets. This includes the Magnetix brand of toys, which has caused the death of many children who have swallowed the magnets. After it became known that Magnetix magnets were killing many children, the manufacturer, Mega Brands, decided to include a warning on the package that stated: “Caution: do not ingest or inhale magnets. Attraction of magnets in the body may cause serious injury and require immediate medical care.” Does this go far enough? Or does it just touch the surface? The Consumer Products Safety Commission, cpsc.org, has been warning us for years now about the hazards of magnets, how easily they can be swallowed by a child, and how quickly and irretrievably they can cause such severe damage when ingested. I have mentioned the CPSC before, but it is a good idea to check their website, cpsc.org, on a regular basis to learn about new recalls of dangerous products. Another good source of information on dangerous toys is the Kennan Kids Foundation, created by my good friend, Don Keenan, a fellow trial lawyer here in Atlanta. The Keenan Kids Foundation keeps abreast of hazardous toys available in America and alerts parents to their dangers. It is a very helpful website of up-to-date information about what is a safe toy and what it not. The warnings obviously don’t go far enough; otherwise, no parent would ever let these magnets even close to their children. And yet children are still being injured by them. Which begs the question: Shouldn’t these magnets just not be sold anymore?